Clearly I love pennant bunting. If you take a look at my sprinkles covered cake, my girly ducky cake, the decorations at the Oscar 2012 party, and even the background decorations in the post about the cupcake tower, you will see that I love it. And pennant bunting is seriously the easiest (if not too time consuming) party decoration that one can make, so it didn’t even occur to me to make a blog post about it. But I was recently scrolling through this blog with my mom and she seemed to think these pennant banners are blog worthy. So here they are. You can make them in any color. The ones you’ve seen here are made from cardstock, but they can be made with fabric or any other material that suits you. The main thing is that the pennant flags need to be fairly stiff. Paper is fine as is. Some canvas type fabrics would work fine, too. If you like a thin, lighter fabric, you can use some starch to stiffen it, or sew (or even glue) a couple layers together. You know what, I supposed it doesn’t need to be too stiff if you aren’t planning to hang the strands at an angle. Because the possibilities are endless, I will stick with how I made the banners that we hung at our Spotted PiG Collection Carnival last year. These are about as simple as they come. 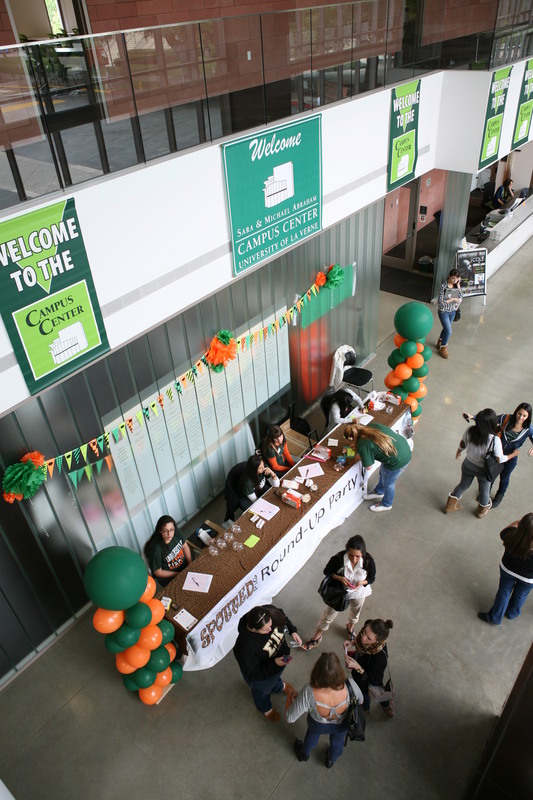 The Banners were a great visual above the registration table. I started by raiding the paper supply cupboard at my office to find green and orange paper. I found two shades of green, and one shade or orange. They weren’t exactly what I would have chosen if I was shopping for materials, but I wanted to be cost efficient, so I went with what we had on hand. Then, I came up with my patterns. I actually used Publisher (though I’m starting to get into my new Adobe Creative Suite so next time I’ll have to use InDesign or Photoshop). Generally, I prefer a flag that’s a little wider, I think the shape is cuter when the top is wider, but I narrowed my triangles enough to make five triangles per sheet. Once I had my triangles placed on the page, I added some texture. I simply dropped in a few patterns and converted the images to black and white. Since my paper was colored, I didn’t want to add more color here. Generally, to maintain the integrity of my colors, I only print color onto white, cream, or light gray. Plus, the black and white printer in our office seems to be able to handle bigger jobs a little faster. 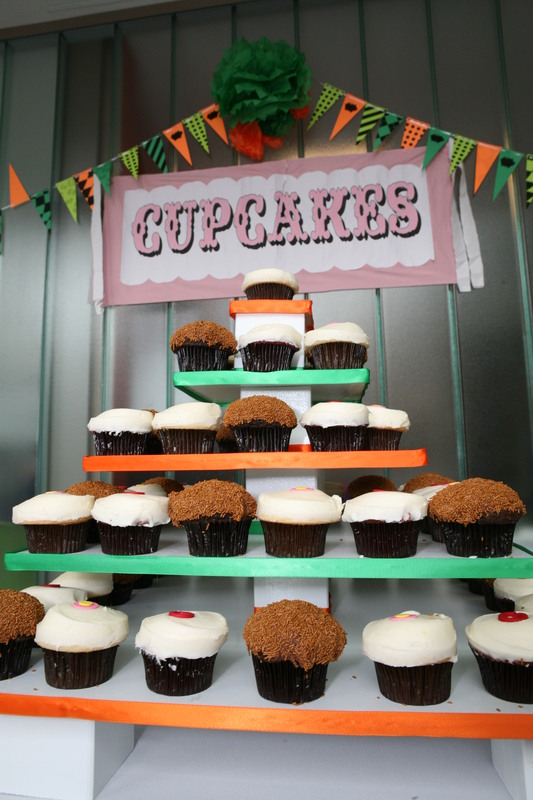 See the various patterns on the flags hung above the Cupcake station. I ran the colored paper through the printer. Since we got five flags per sheet, I printed about 45 pages total. This gave us A LOT of flags! I let one of the student workers cut these ones out. She was able to go pretty fast using our office paper cutter. Then, after all the flags were cut, she went back and whole punched them. She placed two wholes, about an inch in on each of the top corners. We used plain ‘ol curling ribbon to string them up. Since we thought we were going to be outside using ez-ups for our booths, she made strands about 15 feet long with about 25 flags on each. We figured that would give us the right length to put on a 10ft x 10ft booth with room for a nice droopy swag, and ribbon to hang down the sides. The day before our event, May Gray was rearing its ugly head and we made a last minute decision to move the party inside. So, the banners were instead taped to a glass wall , table cloths and other random pieces of furniture that we were given permission to tape things to. We couldn’t tape them to the wall. But, we could tape them to the speakers mounted on the wall. 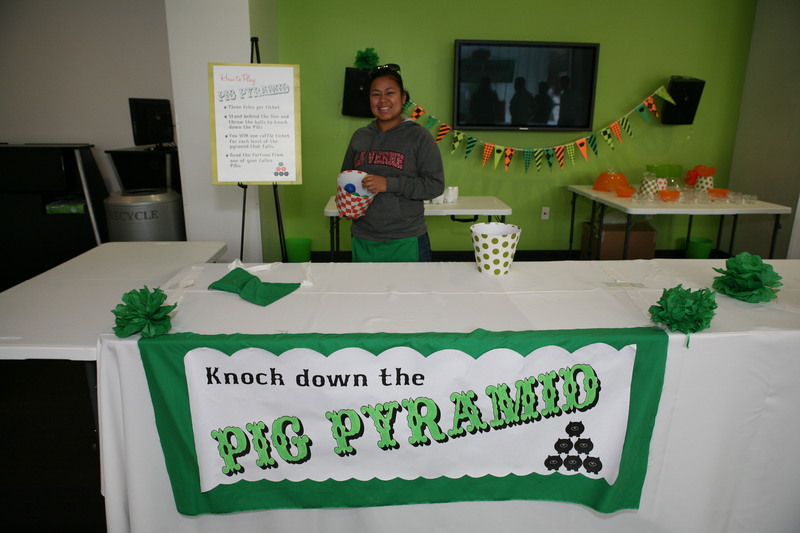 Here the sting of pennants acts as a nice backdrop to two of our games, the PiG Pyramid and Pig Pong Toss. 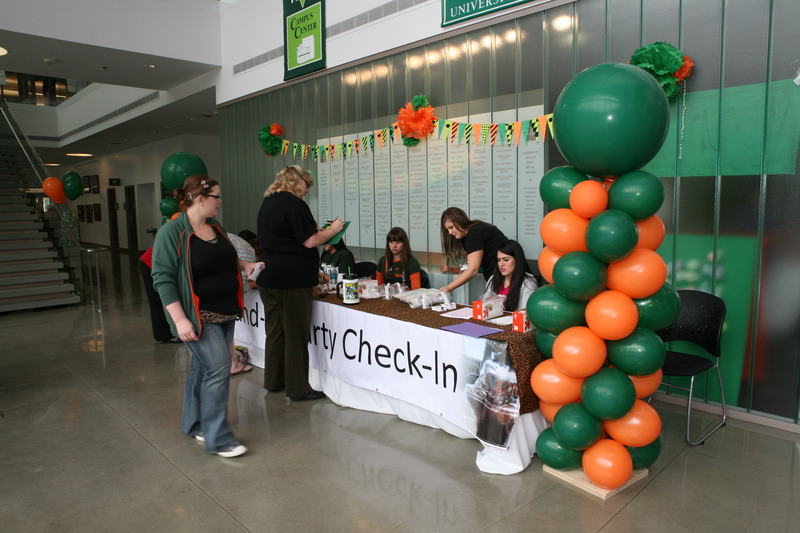 They really brought a festive touch to the Campus Center and tied the whole event together. By moving inside, we had to spread out the booths to a few relatively close but still spread apart areas. Having something as simple as these pennant banners really tied things together. The pompoms you see at the ends of the banners were made from tissue paper. Another simple craft (you can easily find a tutorial for them on pinterest, I’m sure). Next time I make these, I may make them out of burlap. I might even iron on some cute designs or other festive fabric to add some color. DH asked me to make cake for an end of year party for one of the student organizations he leads on campus. Since I haven’t done too many cakes since the baby has been born, he asked me to keep it simple. He didn’t want me to be put out and it needed to serve about 60 people, so the quantity alone would be a bit much. He also said I could make it whatever flavors I wanted, even orange if that’s what I wanted! That’s really generous of him because he hates orange flavored things about as much as I love them. Which is a LOT! So, I decided to make two small-ish cakes rather than one big one. They each have three layers of cake, two chocolate with a coconut layer in between. For the filling, I used strawberry and coconut swirled together and sprinkled mini chocolate chips. The buttercream on the outside is a light almond coconut flavor and I whipped it to give it a lighter texture. 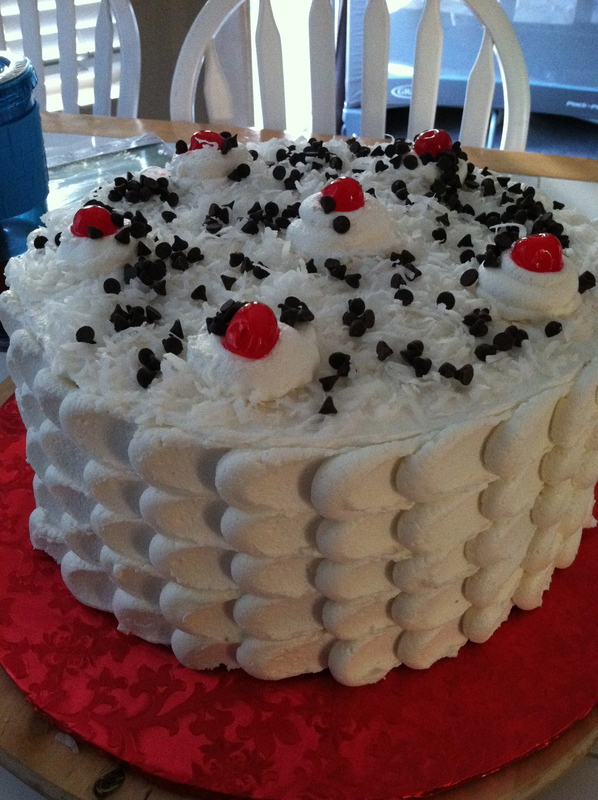 The cakes are topped with sweetened shaved coconut, mini chocolate chips and a couple maraschino cherries for decoration.